Find out how many VMs you’re creating a month with this simple script. If you haven’t seen it, Alan Renouf has made a great script called “Who created that VM?” that populates custom variables to tell you who created a VM and when they did it. I was showing this to a user the other day and they noticed they could also use this to figure out how many VMs they’re creating a month and help track their growth rate that way. Sure enough, once you’ve run Alan’s script it’s really easy to get just such a report. Here’s a sample of the script in action against my vCenter. You can also export this stuff to a spreadsheet, just follow the sample code above. This entry was posted in Uncategorized on March 4, 2010 by Carter Shanklin. Now Available: PowerCLI cmdlets for vCenter Update Manager! 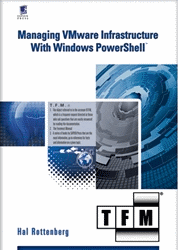 Download the VUM PowerCLI cmdlets now, remember you will also need PowerCLI 4.0 U1. This entry was posted in Uncategorized on March 2, 2010 by Carter Shanklin.